Temple Or Hadash is the only Reform Jewish congregation in the northern Colorado area. We are members of the Union for Reform Judaism (URJ), and support its tenets. You will find Temple Or Hadash to be a warm, welcoming, inclusive, and open Reform Jewish community. Visitors and new members are embraced as Temple family. Everyone is welcome to join, regardless of ability to pay. No tickets or fees are required for our High Holy Days services. Shabbat services take place at 7 p.m. on Friday evenings twice monthly, and a Havdalah service is held every other month. Our famous and fabulous potluck dinners enhance the Havdalah evenings. About half of our membership includes interfaith couples and families. Everyone is treated equally and warmly. Non-Jewish spouses and partners are welcome to participate as much as they like, and can also become board members. Our Religious School is led by professional educators. Students have a full program that includes Jewish history, Torah study, holiday programs, music, Hebrew, and prayers. They lead a Shabbat service each year. Our Religious School is designed to meet any special needs of the students. We participate in the Larimer County Interfaith Council, help feed homeless families through the Faith Family Hospitality interfaith organization, and support Homeward Alliance, serving the homeless and near-homeless in our community. Our Second Night Seders, Hanukkah parties, and Break the Fast dinners are popular with both our members and friends from the community. Please see the Community page for further information about our activities. The Board of Trustees consists of four officers and six at-large members. Terms are usually two years long, and each officer may serve a maximum of three terms. Board meetings are open to any member. Volunteers and opinions are always welcome! Try us out! 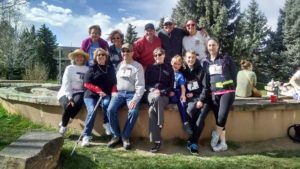 Temple Or Hadash is your Reform Jewish family in northern Colorado.